Images are classified as being real or virtual. Real images are formed when light rays converge. Real images can be projected onto a screen and are always inverted in appearance. Virtual images are formed as the brain imagines that reflected or refracted light rays converge back from their diverging paths. Virtual images cannot be projected onto a screen and are always upright. 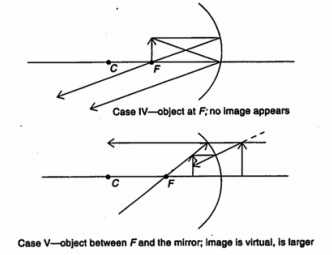 Plane mirrors, convex mirrors, and concave lenses always produce virtual images. The virtual images produced by convex mirrors and concave lenses are always smaller than the object. Concave mirrors and convex lenses produce both real and virtual images. The real images may be larger or smaller than the object, whereas the virtual images are always larger. For a curved mirror, the focal length is equal to half the radius of curvature. 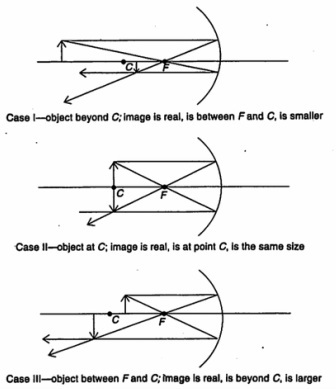 If an object is placed at the focal point of a concave mirror or a convex lens, no image will be formed. Draw ray from top of object parallel to the optical axis and is reflected back through a focal point. Draw ray from top of object through center of curvature. Ray reflects back on itself. Draw ray from top of object through focal point and on to mirror. After reflection it runs parallel to the optical axis. Draw ray from top of object parallel to the optical axis, through the lens and then passing through a focal point. Draw a ray through the center of lens. Path remains undeviated. 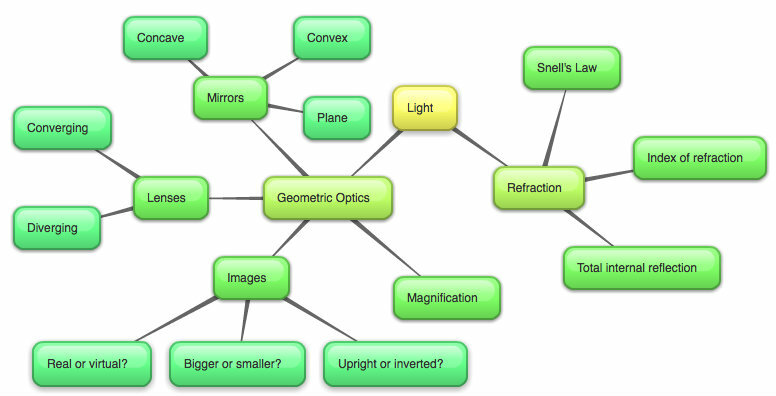 Draw a ray through focal point and on to lens. After lens it runs parallel to the optical axis. Snell's law governs the refraction of light through transparent media. The ratio of the speed of light in air to the speed of light in a transparent medium is called the absolute index of refraction. The speed of light in a transparent medium can be obtained using Snell's law and is inversely proportional to the absolute index of refraction for the medium. When the angle of incidence exceeds the critical angle, total internal reflection occurs and no light is refracted. Fiber optics communication, in which information is processed along hair-thin glass fibers, works because of total internal reflection.